Albert Einstein said, "Everything should be made as simple as possible, but no simpler." But in audio, is simpler always better? Its the "as possible" that sometimes gets missed. In the world of audio design, its commonly accepted that a circuit design should be simple -- as in adding no unneeded complexity that could compromise sound quality. But what if a bit more complexity is needed to make the product sound better? Classé Audio would likely argue that the power supplies theyve designed for their Omega power amplifiers are more complex, and thus more costly, than those in their Delta range. Theyd also tell you that that complexity is precisely whats needed to improve the sound of their top-of-the-line amps. 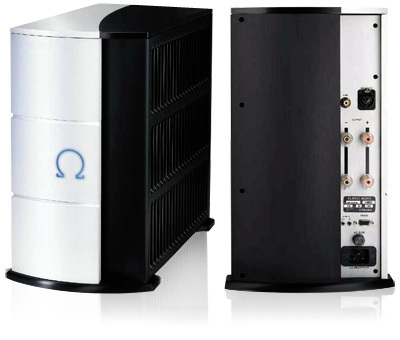 The Omega Omicron Mono amplifier ($25,000 USD per pair), introduced in 2003, is Classé Audios second most expensive product, and benefited from the development of the larger, even costlier Omega Mono ($35,000/pair) of a few years earlier. According to Dave Nauber, executive vice president of Classé Audio, the Omega Omicron Monos "basic topology is the same, but the boards and parts benefit from more recent tweaking" than the Omega Mono has been subjected to. So when I was considering the Classé range for evaluation, the Omega Omicron Mono, which puts out 300W into 8 ohms, made the most sense to audition in "The Worlds Best Audio System": my speakers, the Rockport Technologies Altairs, are claimed to have a sensitivity of 90dB/W/m and an impedance of 4 ohms. On paper, therefore, the Omega Omicron Monos offered what appeared to be plenty of power. And if they might sound even better than the larger, more expensive Omega Monos . . . well, it was off to the races. Classés Omega components are shipped in metal flight cases that are far more costly but far more durable than mere cardboard cartons. Such packing befits a luxury product, and gives one a sense of pride of ownership even before the actual amplifiers have emerged. The Omega Omicron Mono is large but not unmanageable. Though at 108 pounds its very heavy for its dimensions of 16.5"H x 10"W x 19.5"D -- meaning its insides must be stuffed tight with parts -- each Omicrons unpacked bulk can still be maneuvered into place by one person. When Id considered the Omicrons fitnfinish and overall appearance once Id placed them in my room, I sat down impressed, anxious to hear them. A large-format owners manual and custom power cords are included. These babies should have no problem driving the toughest loudspeakers around -- each Omicron Mono is rated to deliver 300W into 8 ohms, 600W into 4 ohms, or 1200W into 2 ohms. This impressive power output is supported by an equally impressive power supply: each chassis contains a 1620VA toroidal power transformer and 48 filter capacitors totaling 201,600 microfarads. The output stage of the class-A/AB Omicron is where things get really interesting. 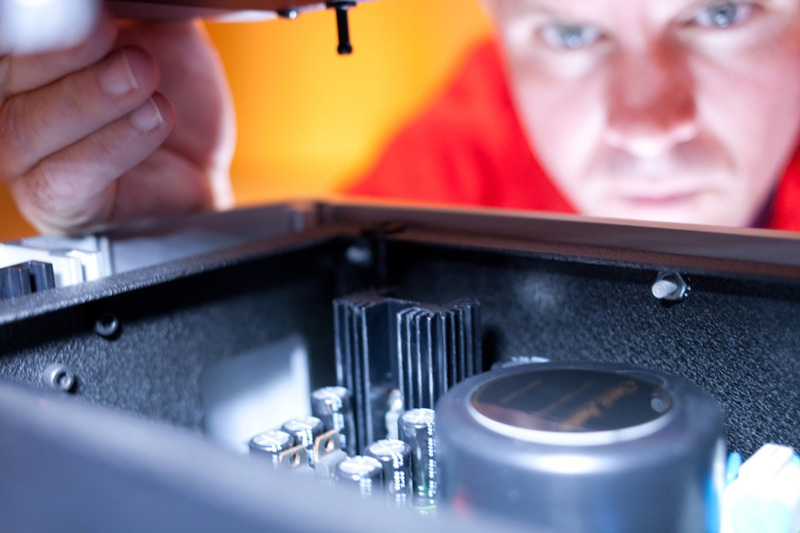 In most solid-state amplifiers, a bank of output devices -- the parts that actually deliver power to your speakers -- is regulated by capacitors, which are passive devices. Either a bank of many small capacitors, or a few large units the size of soda cans, provide a source of voltage to keep the output devices operating in a linear fashion. The problem with this approach is that capacitors must recharge constantly after being discharged into the output devices. When the musical demand is heavy, the cycle of charge and discharge can negatively affect the amplifiers output stage: the voltage drops, and the heart of the amplifier itself can become starved for power. However, the Omicron Monos output stage is not regulated by passive capacitors. Instead, each of the 24 bipolar output transistors has a dedicated regulator that actively supplies it voltage from another, identical bipolar transistor. So instead of a bank of 24 output devices, each Omega Omicron Mono has 48 such devices -- the 24 that comprise the output stage, and another 24 that regulate the first set. Together these act as a rock-solid amplifying circuit that should have only minute voltage drop, even under the most demanding conditions. What this should mean in the real world is that the amplifier wont get stressed when faced with huge dynamic swings caused by demanding musical passages. Other aspects of the Omega Omicron Monos are impressive as well. Classé describes the circuit as being fully balanced from input to output. The chassis itself reverses the usual amplifier shape of being wider than it is tall -- not unlike the flagship models from Halcro and Mark Levinson. The quality of the casework is impeccable: the front, top, and sides show no evidence of screws or any form of fastening hardware. The heatsinks are routed out of a solid slab of aluminum on only one side of each chassis, the other side being smooth. This, to me, seems a far better design for heatsinking a component -- there are no sharp edges, and, when tapped, there is absolutely no ringing to be heard. See the entire Classé Audio Omega Omicron gallery by Chris Lang. The sound of Classés Omega Omicron Monos jumped out at me from the moment I powered up my system after installing them. Now, immediately noting a components sonic character can be a good or a bad thing. Often, a component that is satisfying in the long run produces sound that at first is somewhat boring; such is the nature of neutrality. The distinctive sound of the Omicrons, however, was a departure from what Id just been listening to. I was finishing up my auditioning of the modestly priced and powered Arcam FMJ A38 stereo amplifier ($2300, 100Wpc) -- a good-sounding design, but no competition for some of the behemoth solid-state amps Ive had in my system over the last couple of years. Boy, was I shocked when the first note from the acoustic guitar and close-miked voice of Jakob Dylan poured forth from his Seeing Things (CD, Sony 702328). They were right there -- close and intimate, almost making me move my head back in my seat a few inches. The FMJ A38 is fairly neutral; I could briefly describe it as "smooth but nondescript." In comparison, the Omicrons lit up the room. What stood out first was the midrange -- it was just different. Male voices, in particular, were rendered with more body -- that sense that the men were physically present in the room because the physical outlines of their bodies were more distinct and filled with living, breathing humanity. The sense of palpability was startling. How the Omicrons accomplished this was interesting. First, it seemed that the midrange was a bit more forward than Im used to hearing. Artists such as Jason Mraz seemed placed closer to my listening seat than Im used to hearing them. Mrazs voice on "Mr. Curiosity," from his Mr. A-Z (CD, Elektra 83833), sounded natural but forward. But being a touch up-front wasnt all that was going on. There was also more information within the outline of the performer. I could hear deep into Mrazs voice without any sense of strain or fatigue. I could also "see" Mraz more clearly in my room. It took me only an hour or so to get used to this quality; soon, it sounded totally natural. In fact, when I flipped back to the Arcam A38 for a quick refresher before boxing it up to send back, it sounded recessed and too laid-back, almost muted, in the midrange. The Omega Omicron Monos soundstaging qualities were complemented by the greater physical presence they gave performers. Not only was there simply stunning separation between instrumentalists and vocalists, but the width and depth on the stages on which the musicians were set were expanded as well. These amplifiers should augment a good set of loudspeakers by not truncating the sense of space, whether natural or studio-created, between musicians. In fact, they should expand on these qualities, giving the sounds of the musicians more room to breathe -- the Omicrons created realistically sized spaces that had me "watching" as much as listening to the performances. Fascinated by this aspect of their sound, I found myself scrolling through my music collection, looking for tracks that would allow me to hear greater dimensionality. An example is David-Lloyd Jones conducting the Royal Scottish National Orchestra in Holsts The Planets (CD, Naxos 8.555776). I might as well have been watching Raphael Nadal and Roger Federer, such was the interplay between right and left and front to back. Normally this is the part of the article where I would go through my checklist of important sonic characteristics, but the Omega Omicron Monos were sufficiently neutral as to not warrant that type of description. The frequency extremes were simply excellent -- the bass was solid and deep, the highs extended and detailed. Tonality was spot on, and there was no sense of a lack of power -- in fact, the Omicrons seemed to have more reserve than just about any amplifier Ive had in the Music Vault. But this doesnt mean that the Omicron Monos sounded like all the other solid-state Ive recently heard -- to the contrary. Omega Omicron Mono vs. Vitus SS-101: The Vitus amplifier was just as quiet as the Classés, and both were about as good as Ive heard in this regard. The Vitus, though, was more laid-back, while the Classés sounded more immediate. Voices were somewhat more relaxed through the Vitus, and sonic landscapes were rendered in a more evenhanded manner. Performers seemed a touch farther back on the stage, and just slightly smaller, through the SS-101. This wasnt a night-and-day difference, but I could understand if different listeners preferred one sort of sound to the other enough to sway a purchasing decision. Omega Omicron Mono vs. Pass Labs X600.5: This was a fascinating comparison. The Pass and Classé amplifiers are both so darn good that Im almost embarrassed to call either of them "weaker" in any area -- theyre both simply great. But theyre not the same. The Pass Labs arent as quiet as the Classés. I definitely got a sense of "blackness" with the Omicrons that the Passes just couldnt muster. On the other hand, the Pass amps had an unrestrained quality -- as if they were letting go of the notes more easily -- that was somehow missing from the Classés. It was if the Passes just let the signal flow with no resistance at all. The Omega Omicrons propelled things along a bit by comparison. The Classés moved ahead of the Passes in the ability to separate performers within the soundstage, and there is no doubt that their midrange presentation was more energetic and more full of information. I could easily live with either amplifier -- both are fantastic, and among the worlds best amplifier designs. The Classé Audio Omega Omicron Mono is not the newest high-end amplifier design out there. But when it comes to power amplifiers, not many of the very newest designs have lit my fire. Sure, theres a bevy of class-D, class-T, and class- . . . well, you name the class, and these days there are a lot of power amplifiers to choose from. And its easy to understand why a company would make a digital-switching product when such a choice can reduce the cost of everything, from parts to labor to shipping. And if these small-fry switching amps were sonically better than the larger "old school" designs, all would be right in the world -- or at least the worlds amplifying corners. But when I listen to Classé Audios Omega Omicron Monos, Im reminded again of what Einstein said: "Everything should be made as simple as possible, but no simpler." It occurs to me that, as far as power-amp perfection goes, maybe a design as complex as the Omicrons is as simply built as possible. It could be that were just around the corner from smaller, lighter, easier-to-manage amplifiers that will blow away the Omega Omicron Monos, but I wouldnt put my money on it. My guess is that, to many audiophiles, and to the companies that make amplifiers, the advantages of smaller size and greater efficiency along with lower prices are acceptable even if sound quality suffers. And thats OK with me, too. But if you want the best sound that transistors can produce, you just better go out and invest in some Classé Omega Omicron Monos before their ilk disappears altogether.